Moudros is the safest natural harbour of Lemnos situated in the south west of Moudros bay in the southern part of the island (British Admiralty 1945, 382; Tourptsoglou-Stefanidou 1986, 242). 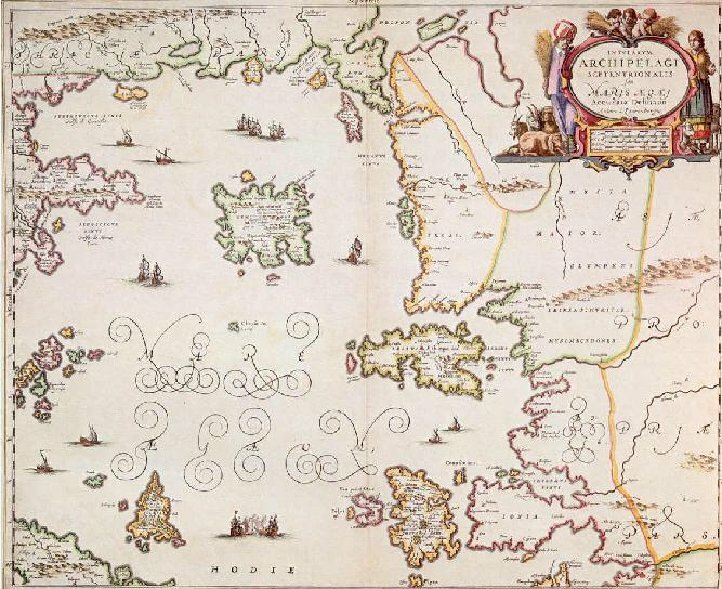 Moudros was well protected by winds due to its geographical position and well defended from raids due to a fort on a nearby hill and a tower, property of the Vatopedi monastery as well as much land around that area (Vatopedi II, no. 114, 283; Kontellis 2004, 136-139). A stop of the delegation on the island should not come as a surprise since Lemnos was during the late Byzantine period part of significant trade routes from Constantinople to the Aegean Sea. Furthermore the fertile soils of the island, appropriate for cereal cultivation and fruit trees, and the big quantities of sheep raised on the island made it an excellent choice for supplies in food products and wine. An additional reason for stopping on Lemnos could have been that Demetrios Palaiologos, John VIII’s brother who was accompanying the Emperor in his journey was the governor of the island in that period (Patmou A, no.45, 320-6).